When you purchase olive oil with the COOC Seal of Certification, you know you are buying the best extra virgin olive oil made in California. Let’s face it: many of the olive oils on the market today claim to be extra virgin, but aren’t. To give consumers confidence they are purchasing 100% extra virgin olive oil, the COOC created the COOC Seal Certification Program. Using stricter standards than international requirements, only the best California olive oils qualify for COOC certification. Following every harvest, we assess every member’s oil to ensure that it qualifies to display the COOC Seal. International standards as well as COOC regulations require that olive oil meets “both” chemical and sensory standards to be sold as extra virgin. To meet the criteria for the COOC Seal, each producer must first submit a laboratory analysis which measures specific parameters that indicate the careful handling and storage of the olives and oil. No chemicals or extreme heat may be used during the extraction process. Next, the oil is submitted to the COOC Taste Panel for sensory evaluation. This panel of certified tasters conducts a blind taste-test to ensure the oil is free of defects. Flavor defects indicate the use of poor quality olives, or that problems occurred during milling or storage. If olives are damaged (poor handling, moldy, frost), or they are not milled within 24 hours of being harvested, the oil will not be top quality (extra virgin). Milling at a high temperature (over 86°F) can also negatively impact flavor and quality. Only after the oil has passed both tests does it earn the right to display the COOC Seal. Purchasing olive oil with the COOC Seal means you are buying fresh, California-grown, 100% extra virgin olive oil — the healthiest and most delicious olive oil on the market today. 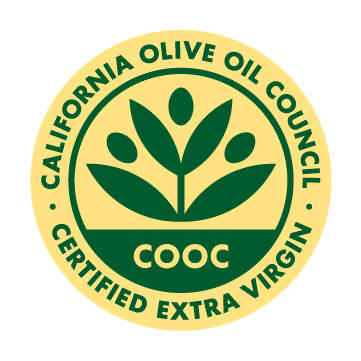 Look for the California Olive Oil Council’s Seal with the most recent harvest year to ensure you are purchasing certified extra virgin olive oil from California.